Kimcheelicious Fine-aged Foods are naturally tasty, gluten-free and made with no animal products or preservatives. Mildy-spiced, savory and tart—our foods are made in small batches with the finest ingredients to ensure the best quality and full flavor. Our fermented foods are naturally healthy, full of the probiotics that our bodies need. We don’t use animal products, preservatives, corn syrup or MSG, only the finest ingredients to give you a deep long lasting flavor as nature intended. Have some kimchee with your favorite meals, or use it as an ingredient for cooking. Kimcheelicous foods are prepared with the utmost care as vegan and gluten-free, but are made in commercial kitchen that also makes wheat-based foods. This specialty market offers grocery items, gourmet sandwiches, prepared foods & quality meats. Ssamjang is the quintessential Korean dipping sauce—sweet, savory and mildly-spiced with just a slight tang. It literally means “wrapping sauce”. Wrap your next meal in deep flavors of garlic, ginger, honey, roasted sesame, Korean chili and miso with a baby kiss of white rum. Use it as a spread for sandwiches or basting broiled and BBQ dishes. 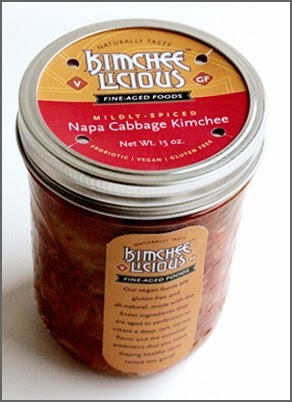 Have our salad-cut Napa cabbage kimchee on a burger, dog or your next grilled cheese sandwich. It’s savory, tart and brings out the flavor of meat and vegetables. Shred it and spice-up your pulled pork, or just eat it right out of the jar. Save the juice for marinade and dipping sauces. 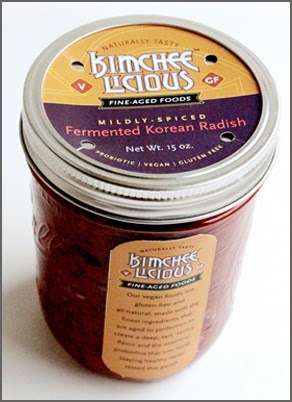 Our fermented Korean radish is finely-diced for small, intense flavor bursts. Use it as a side-dish with your next meal or add it to your potato salads of mac ‘n’ cheese for an extra kick. Make a quick hot and sour soup for those chilly winter days. Our fermented radish is perfect topping for any egg dish.